Our family has finished reading the third book in this series so I’m writing a short review to encourage others to read it. Really, it’s great! 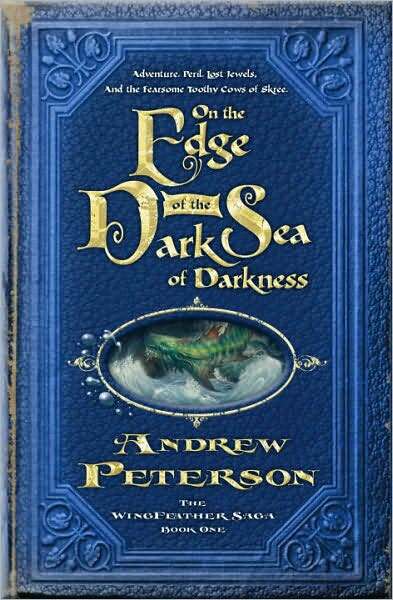 You may know Andrew Peterson as a contemporary Christian music artist, but did you know he is an author, and one of the best? At every turn Andrew Peterson surprises you again until your mind begins coming up with crazy, bizarre things that might happen next, but of course you stop yourself with a laugh; “That’s too crazy to happen.” It never is! I look forward to forgetting everything so i can read it all again. Janner, Tink, and Leeli Igiby live in a little town of Glipwood, next to the dark sea of darkness. They were happy (except for the Fangs that now guarded the town, ever since the Great War, swaggering about and taking children as leasure) until now, and it started with the Dragon Day festival. Meanwhile, Gnag the Nameless is searching all over Scree for the Jewels of Anniera that will enable him to conquer Glipwood, Scree, and possibly the world. Andrew Peterson has really written a soon be classic that will inevitably be passed from generation to generation. On the very first page you are told in plain words that this is unlike any book you have every read, and if you laughed at the title, you won’t believe what’s inside. And to anyone who asks, I must say my favorite character is Peet, Nugget, or Podo.